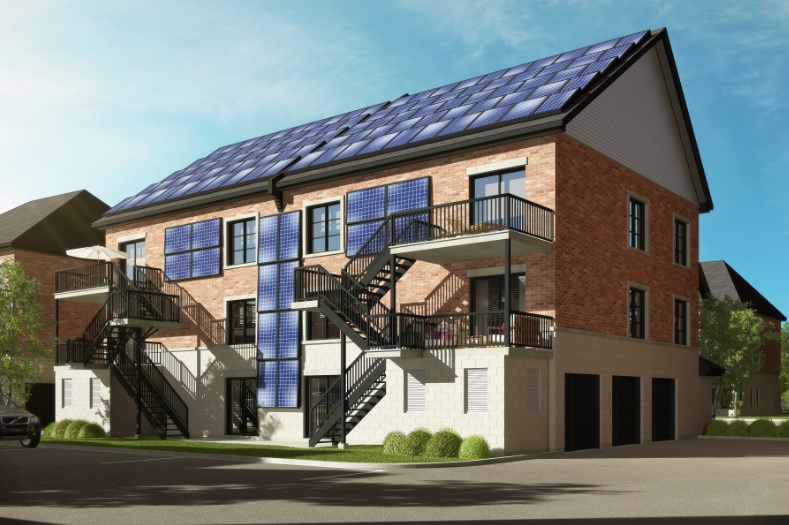 (June 22, 2015, Laval, QC) Lucky homeowners in Laval will soon be moving into new net zero energy homes. 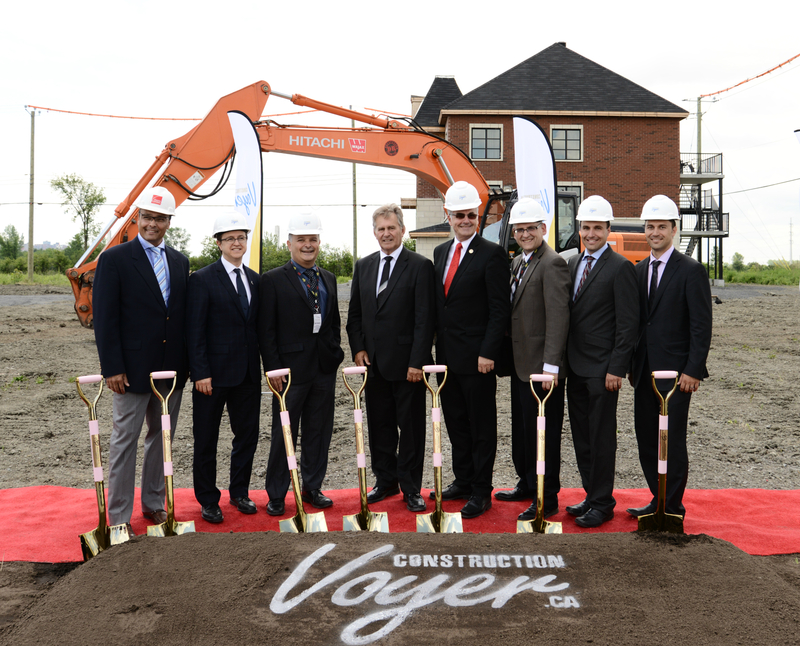 Today, Construction Voyer broke ground on six condos as part of a national program that will see a minimum of 25 net zero energy (NZE) homes built across Canada. NZE homes produce as much energy as they consume, on an annual basis. Construction Voyer is the only Quebec-based homebuilder selected for the project, which is part of Natural Resources Canada (NRCan)’s ecoENERGY Innovation Initiative (ecoEII). The condos, expected to be completed by March 2016, are being built in the Duvernay East neighbourhood of Laval, close to the Highway 25 bridge. A number of features allow the condos to achieve the drastic reductions in energy consumption required to meet NZE standards, including innovative heat and cooling equipment, solar PV panels on the roof, and the innovative exterior insulation CodeBord® Air Barrier System from Owens Corning Canada. NRCan is providing $1.96 million in support for professional services required for the planning, design and construction of the houses. The balance, over $2 million, will come from Owens Corning Canada, participating builders and the building industry in the form of in-kind contributions to fund the construction of the homes. The project, managed by buildABILITY Corporation, includes five builders across Canada: Construction Voyer (Laval, Quebec); Mattamy Homes Limited (Calgary, Alberta); Reid’s Heritage Homes (Guelph, Ontario); Minto Communities (Ottawa, Ontario); and Provident Development Inc. (Halifax, Nova Scotia). Additional high quality photos available on request. Construction Voyer, founded in 1973, has built over 6,000 residential units: single-family dwellings, condominiums and rental buildings. Although the company originally earned its reputation primarily in Laval and cities along the northern belt, in 1998 it began expanding its activities onto the island of Montreal. Recently, Construction Voyer has developed an expansion plan to extend activities into new territories. Owens Corning Canada is part of Owens Corning, a US$5.2 billion company with 15,000 employees worldwide, including 654 in Canada. Owens Corning and its family of companies are a leading global producer of residential and commercial building materials, glass-fiber reinforcements, and engineered materials for composite systems. A Fortune® 500 company for 60 consecutive years, the company is committed to driving sustainability by delivering solutions, transforming markets, and enhancing lives. Owens Corning operates 4 plants in Canada, manufacturing PINK® insulation and other energy-saving products. The ecoENERGY Innovation Initiative (ecoEII), announced in the 2011 Budget, is a $268 million program searching for long-term solutions to eliminate air pollutants and greenhouse gas emissions from energy production. Eligible projects must be demonstration or research & development.